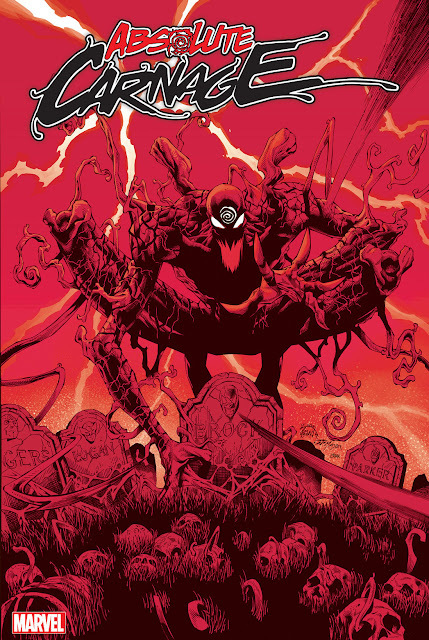 Just got done with issue 5 of Carnage - WOW! With this game changing series wrapped up, I couldn't wait to here everyone's thoughts. So without further ado, here is TVS's official review of Carnage. Be warned! There are spoilers so read at your own risk! The Story: The story starts with Iron Man and Spider-Man are called to the scene of an armored car being attacked by Doppelganger. It ends with Cletus Kasady back from the grave planning his comeback. The Good: Writing- This series had me guessing the entire way through. The build up to the Kasady reveal at the end of issue three gave me goosebumps! With all of the characters introduced, there was no way to know what direction Wells (the author) was taking us. I am also glad that he realized that no one else could be Carnage except for Kasady. It was the perfect blend of action and suspense. Art - Loved it! I've said from the beginning that Cain's (the artist) digital art was made for symbiotes. Even looking passed his Carnage rendition, the backgrounds and scenery was amazing. I'll admit that there were a couple panels that were a little too dark or had too much going on in a small space, but over all I prefer his style to a lot of hand drawn comics. The Bad: Scorn - Do we really need another symbiote? I don't feel like she has anything that will let her stand out from the already established symbiotes (we have the female, Scream; we have the Carnage spawn, Toxin; we have the 'good guy', Venom). 2 Month Wait - So it's not really something bad about this books, but it did piss me off. Two months between issues is entirely too long. I found myself losing interest and forgetting issues were even coming out. Then I started to read and forgot what was going on (even with the first page summary) and had to bust open the previous issue and skim over it to jog my memory. The Overall: 4.5 outta 5. Carnage came back from the dead in style! I am so glad the same team that brought us this mini is teaming back up for the next Carnage adventure too. Sound off in the comments; I'm really interested in hearing how the fans feel about Venom's son coming back to the Marvel Universe.